VFL: Round 14 win in 60 seconds Watch highlights from Collingwood's 71-point win over North Ballarat in round 14 of the VFL. 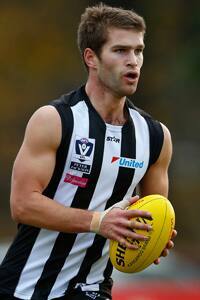 Jordan Kelly and the VFL Magpies have a 20-point lead at half time of a round 14 clash with North Ballarat. A match-winning third quarter kicking into the wind has helped the VFL Magpies to a 71-point victory over North Ballarat. Held scoreless in the first quarter, Dale Tapping’s side quickly found its recent form in the second term. Four goals with the wind were followed by another five against it the following term as the Magpies showed why they have become a premiership contender. The percentage-booster that Collingwood has been searching for for so long was finally realised in the final term. Lachlan Ferguson, Tom Phillips, Tim Broomhead and Corey Gault kicked last-quarter majors as the visitors won their seventh consecutive game. 1:00pm - Welcome to Collingwood Media's live coverage of today's VFL clash with North Ballarat at Eureka Stadium. Collingwood VFL radio is back in action today. Michael Leeds is your host commentator, and the call is underway. 1:02pm - No score yet after two and a half minutes in the first term. Collingwood are kicking to the Melbourne end of the ground. Light drizzle falls over Eureka Stadium. 1:09pm - All three AFL emergencies are playing in the VFL today. Tyson Goldsack and Marley Williams both flew to GWS with the team yesterday and have returned to play today. 1:09pm - Collingwood yet to go inside 50 after almost 10 minutes of playing time. North Ballarat lead by a solitary point. 1:10pm - Ben Crocker is back in the VFL team today after overcoming a knee injury. He's looking ominous early. 1:13pm - Still deadlocked at 0-1 in favour of North Ballarat at the moment. All play taking place on the outer side, away from the grandstand here at Eureka Stadium. Jordan Kelly busy early in defence. 1:18pm - North Ballarat have a second behind to add to their tally. We're still yet to score after 19 minutes. 1:21pm - Good to see Mason Cox in the crowd supporting his VFL teammates. We're definitely a long way from Texas today. 1:25pm - After 23 minutes, North Ballarat score the first goal of the afternoon. It's been a slow start from both teams, but the Roosters are on the board. We trail 0-8. 1:30pm - Quarter time at North Ballarat. Tough quarter of footy which ended in favour of the home team. We trail 0.0 (0) to 1.2 (8). 1:36pm - Second term underway. VFL Magpies have the wind this quarter. Alan Toovey looks to make the most of it as he runs inside 50. His kick is smothered by a Roosters' defender. 1:39pm - Jack Frost and Tyson Goldsack impress on the last line of defence. Ball clears to Wyatt on the grandstand wing. 1:40pm - Frost really good once again in the backline. Lays a great tackle and forces a 50-50 ball. Rupert Wills launches one from 65m out on the wing. It bounces, bounces, bounces... GOAL! #vflmagpies get their first of the day. 1:44pm - Back-to-back goals at the scoreboard end! Rupert Wills' monster kick is quickly followed by a clever goal by Gus Borthwick. We lead North Ballarat 12-8. 1:45pm - Marley Williams sends the ball inside 50. Tyson Goldsack is the target. He's shifted from a defender to a forward in the second quarter. 1:47pm - Campbell Lane has gone from No.77 to wearing No.52 today. He's involved with a quick handball in defence. 1:50pm - North Ballarat doing well to hold the momentum of the VFL Magpies. 15 minutes gone and we've kicked two goals this term. 1:52pm - Throw in just shy of the Magpies' 50m arc. Corey Gault assisting Jarrod Witts in the ruck today. He flies and wins this hit-out. 1:55pm - Umpires are earning their money today. Stoppage after stoppage on the outer wing. 1:56pm - Free kick going the way of the Magpies at centre half back. Lachlan Ferguson is the man on the end of it. He sends the Pies forward by foot. 2:01pm - A NB Roosters shot for goal goes straight up in the wind and comes straight back down in nearly the same position. No score. 2:03pm - Lachie Ferguson + Campbell Lane score back-to-back goals for the VFL Magpies. A three goal lead is starting to look handy as we approach half time. 2:07pm - We've ticked over 30 minutes in this second term. With just the four goals, you wouldn't think there'd be long remaining. VFL Magpies lead 28-9. 2:10pm - Half time siren sounds. Four goals with the wind that quarter and we've got a handy half time lead. 2:30pm - Third quarter underway at Eureka Stadium. Pies kicking to the Melbourne end of the ground this quarter. Just one behind has been scored at our end so far today. 2:32pm - North Ballarat have the first goal of the quarter. Our lead is cut back to 14 points. 2:34pm - Campbell Lane has a set-shot 35m out, on a slight angle. This will be an incredibly difficult kick given the conditions. 2:39pm - Nick Gray further extends the VFL Magpies lead with a clever goal in the forward pocket. Back-to-back goals against the wind... great start to this quarter. 2:42pm - Another Nick Gray goal follows. This time it's a set shot that keeps the goal umpire busy. Lead is now 29 points in favour of the Magpies. 2:48pm - Huge last five minutes for the VFL Magpies. Tim Golds and Rupert Wills have added goals from close-range and the lead has quickly grown to 45 points. Another chance follows as Ben Crocker marks in the forward line. 2:50pm - Crocker's set-shot from deep in the forward pocket is pushed out of bounds by the strong wind. No score. 2:52pm - Normally you look at a flag or the branches on a nearby tree to judge the wind... not here at Eureka Stadium. The goal-posts at both ends are shaking as conditions remain ugly. 2:54pm - Goldsack and Phillips combine really well in defence. Goldsack flew high to effect the spoil, and his young teammate ran away with the loose ball. 2:55pm - 27 minutes gone here in this third term. Massive quarter so far by the VFL Magpies. Five goals is worth almost double kicking into this wind. 3:02pm - Siren sounds to end the third term. And a positive one for the Magpies at that. Five goals to North Ballarat's one and we take a strong lead into the final change. 3:10pm - Inside 50 for the Magpies within seconds of the quarter starting. Lachlan Ferguson marks... and goals. 3:13pm - This wind clearly is affecting everyone at Eureka Stadium! VFL Magpies lead 67-19 after six minutes in the final term. 3:18pm - Tim Broomhead continues an impressive afternoon. He finds Tom Phillips with a clever handball and Phillips kicks the goal. Collingwood lead 73-19. 3:22pm - North Ballarat haven't got close to scoring after 12 minutes in this final term. VFL Magpies well on top. 3:32pm - Final term is being played behind the flanks at the moment. Scoring has dried up as the VFL Magpies hold a 57-point lead. 3:37pm - Behind to the Magpies at the scoreboard end. 27 minutes gone and the lead has grown to 58 points. 3:39pm - Tim Broomhead kicks a late one from outside 50. Perfect set shot from directly in front of goal. 3:43pm - 34 minutes gone in the final term and this quarter shows no sign of finishing! The rain is getting heavier and the skies are getting darker. Shouldn't be long to go now. 3:47pm - Final siren sounds at Eureka Stadium! Collingwood 13.12 (90) def. North Ballarat 2.7 (19).